If I could wish for one thing, and I didn't feel compelled to wish for halving extreme poverty worldwide, ending the AIDS epidemic in Africa, providing primary education for all of the world's children, etc., or for a loving spouse and multiple healthy children for myself within the next ten years, or for a long and healthy lives for my family and friends, or for...well, anything particularly meaningful like that, I would wish for a self-cleaning kitchen floor. The closest I could find in real life was this, but I don't think that quite does it for me. I don't feel this way about sweeping, dusting, doing laundry, doing dishes, or cooking. I don't even really feel this way about scrubbing out the toilet bowl or about cleaning the inside of the fridge, although I'm not particularly keen on those tasks either. But there's something about washing the kitchen floor that is just...a pain in the neck. It's kind of physically demanding (as things I do go), involves moving all of the chairs out of the kitchen first and then putting them all back after the floor has dried, the amonia smells, and I know that it's going to be all dirty again within days. The same is true of some of those other things, but I guess they just seem like less work to me. Maybe because I do them more often. On a totally unrelated note, I saw Beauty and the Beast tonight, courtesy of nuqotw. (Thank you!) It was the first time I've seen it since 1991 or 1992, when I saw it on videotape in the living room of my childhood home, possibly during December or February vacation. I guess I was about twelve the first (only) time I saw it, and now I'm twenty-seven, so that means that I saw it fifteen years ago. The only other movies I've done that with--seen once and then a second time more than a decade later--are The Court Jester and It's a Mad, Mad, Mad, Mad World. With those two, though, I saw them the first time when I was younger, so I didn't really remember them very well the second time around. It was more like watching them for the first time. 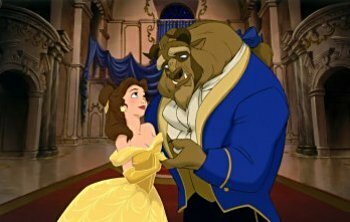 With BATB, though, I remember seeing it the first time quite well. I remember the shaggy orange carpet, and the 70s-era goldenrod drapes, and my younger siblings being little children (to my clearly more-mature self), and the 19" RCA television. I was so enamored of the songs from BATB that I held a tape recorder up the TV speaker and recorded the songs off of the movie to listen to later. (Bootlegging, I guess, but so technically deficient that I can't imagine anyone would care.) I wonder what made me like the songs so much? Did I identify with Belle? With the Beast? Hmmm.... Clearly remembering anything that happened fifteen years ago has a way of making me feel old. It confirms, at the very least, that I am, indeed, a full-fledged grown-up. It was also really strange think about all of the intervening things that have happened since I last saw BATB: high school, year in Israel, starting college, taking a semester off, resuming college, writing a 116 page senior thesis, being unemployed for six months after college, moving to a new city, two different apartments, two different jobs, a grand total of six different roommates (in three years), and some fun traveling to keep things interesting. If you had asked me, at twelve, to predict what my life would look like in fifteen years, I would probably have been way off the mark. I remember being asked, at some point in junior high, to imagine what my life would look like in one year, in five years, and in ten years. I couldn't get much past one year, and certainly not past five. It was almost impossible to imagine anything ten years into the future when I was in junior high, since ten years before that I had been, what--three years old? If you could have told me, at twelve, what my life would be like at twenty-seven, I don't think I would have understood it, really. And it would have made the past fifteen years so boring! I'm not sure that I understand the desire that some people have to see their own futures. What would be the point of getting there if you already knew how it was going to turn out? Me? I'd rather have a self-cleaning kitchen floor any day!